A trip out to the Farm on April 9th made me very happy. The little beauties were up through the straw and looking for sun! Randy and I had to rake some of the straw off of it as it was matted down and wet and some of the finer varities had trouble poking up through it. 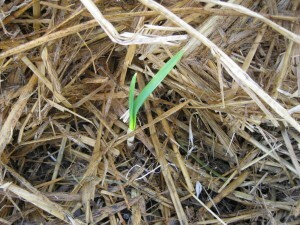 Taking the straw off is always a gamble as there still could be a frost that could injure it.